Julius Prezelski began his career in the business world but soon transitioned to teaching, where he could combine his passions for business and basketball. Inspired by Beth Kobliner’s Get a Financial Life, he developed a business curriculum at DeMatha Catholic High School in Hyattsville, Maryland, in the ’90s. 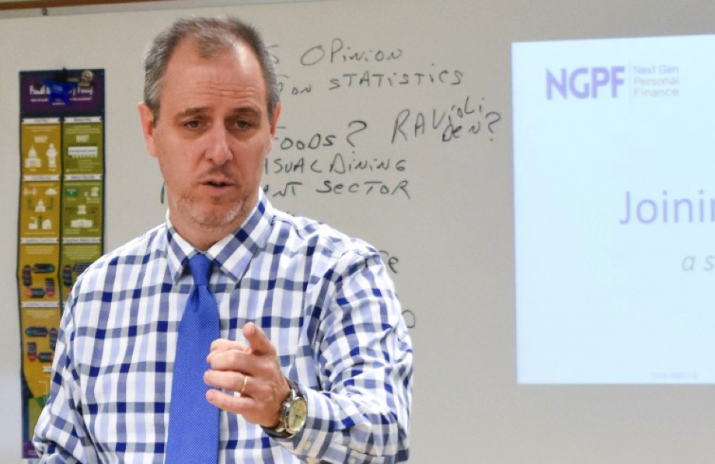 That curriculum evolved into multiple sections of business law and college-prep and honors-level personal finance courses at Mount Saint Joseph High School, where he has taught since 1997. Prezelski believes that every high school student should take a personal finance course and that gaining financial knowledge can be life changing. In addition to teaching, he moderates the school’s business club and personal finance challenge team (the PFC placed third statewide last year). has become more popular each year and is now the most requested elective offered. This next school year will have the greatest number of sections, growing from only three a few years ago to eight. In the last few years, Prezelski has focused on broadening his skill set and enriching his personal finance curriculum. By attending workshops and conferences, and through his own daily research, he learns the latest in the field, applies it to his courses, and shares it with others. says. “I attended a conference in San Francisco last month for three days, where I worked on learning new curriculum with a nonprofit called NextGen Personal Finance (NGFP). 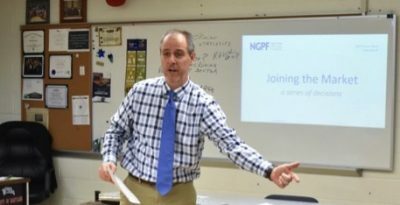 This allowed me to bring back a lot of new information for next year’s personal finance class.” This summer, Prezelski will be one of 24 teachers selected from hundreds of applicants nationwide to attend the NGPF Summer Fellows Program in Palo Alto, California. Prezelski also enjoys sharing his business experience with people outside the classroom. He spoke to our fathers’ club a couple of weeks ago and shared the experience of having his older daughter graduating college this year — and continuing on to earn her master’s degree in accounting — and his younger daughter just entering college in a year. The theme centered on the presentation, called “Banking, Credit, the College Process, and Important Facts about the Next Four Years in College,” was geared to parents who have sons entering college soon. Just last week, at a college transition assembly, Prezelski shifted gears and spoke to our entire senior class about responsible money management after high school. He shared the lessons his daughter learned about maintaining sound financial health during a stressful but exciting time. Prezelski imparts much newfound information to the Mount Saint Joseph staff and is often sought out by colleagues looking to chat more about his area of expertise. This communication is perhaps the best example of Prezelski’s passion for sharing information and is an expression of his belief that everyone can benefit from learning more about personal finance. along the way. Getting personal about personal finance is what makes Prezelski’s knowledge and expertise especially beneficial not only to his students but also to parents. Really, anyone who has the good fortune to talk finance with him. WOULD YOU LIKE TO SAVE THIS STORY FOR LATER OR SEND IT TO A FRIEND? Julius Prezelski Gets Personal About Finance? WANT TO SEND THIS STORY TO A FRIEND?